Living with two girls who turn out to be fantastic cooks has its apparent advantages. I can no longer count on two hands how many times I’ve wandered into the girls’ apartment to smell something amazing being baked/cooked/fried/prepared, roughly ten seconds before platters of food get shoved in my face accompanied with inquisitive stares that scream “what do you think? (and don’t you dare say anything bad about it!)”. Despite this pressure, these girls know how to cook and I can’t remember ever having anything bad to say about any of their creations. There’s definitely nothing more amazing than coming home after an epic night bartending and seeing an aluminium (sorry Allie, ‘aluminum’) foil-wrapped plate full of goodies waiting to be heated up and consumed at record pace. So I can’t really have anything to complain about right? Unfortunately, skilled as Allie and Kahina are, there is one hugely embarrassing downside. Any time I attempt to create something of my own, it’s inevitably followed by ‘so-you’re-really-going-to-try-putting-those-ingredients-together’ stares, and two pairs of waiting eyes watching to see what my next culinary disaster will yield. Take for example the last time Kahina made crepes. She is a genuine whizz when it comes to these things, I’m pretty sure making crepes is as inherent to French DNA as making pastries or appreciating fine wine. Anyway, Kahina was making us all breakfast and I, attempting to get in the spirit of things said “why don’t I try making my own?”. Cue raised eyebrows. Five minutes later what can only be described as a crepe batter explosion is all over the pan and surrounding benches and Kahina and Allie in stitches as I try to repair the damage to my breakfast. Crepes 1, Ciaran 0. So my latest experiment was also something of a disaster. Both the girls were out and I figured I’d try to quickly cook up something before running off to Uni. We had a fair amount of puff pastry and some eggs left in the fridge from a previous cooking adventure, and having seen something about baked eggs in puff pastry on Masterchef, I thought I’d give it a go. What could possibly go wrong? Allie came home as I was finishing removing them from the oven and immediately I got the “omg-what-were-you-thinking-it’s-just-eggs-and-pastry” looks. Needless to say it was extremely embarrassing and yielded weeks of “Ciaran and his egg tarts” jokes. But this time I was intent on proving I could do something with the idea, and came up with these awesome breakfast tarts. I’ve seen variations of them at cafés all over the place and they’re just so easy that anybody can whip them up in a matter of minutes to impress even the most intense and critical foodie. Enjoy! Try to use a muffin tin or something similar. Fortunately I managed to use the girls pie tins which turned out to be perfectly sized for these tarts. Take the puff pastry out of the freezer and leave to defrost. Fry the bacon until crispy and then leave it on the side. Slice the mushrooms thinly, cook in a pot until soft and then set aside in the pot. Grease the muffin/pie tin with butter and then arrange the puff pastry so that you make a small bowl in the tin to hold the eggs. Add one full egg and then more egg white if required to fill the pastry bowl you’ve made. This can vary depending on the size of the bowl but be mindful the pastry and the egg will rise so try not to overdo it. 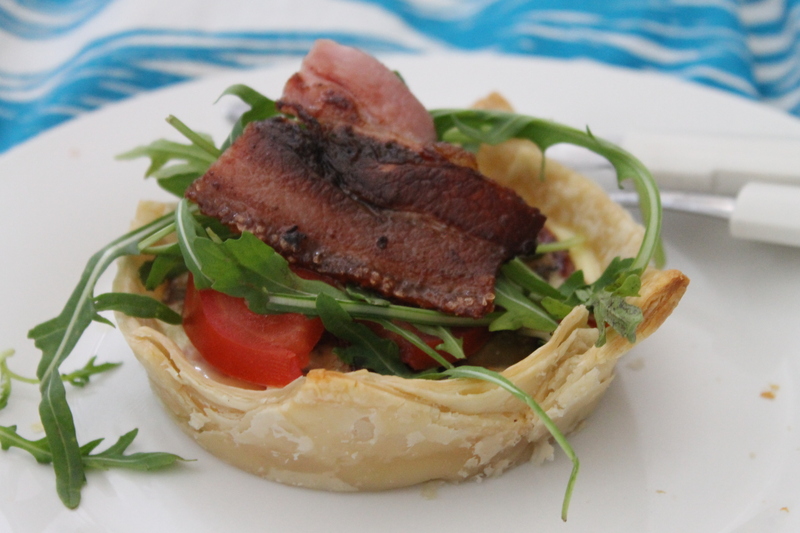 The bacon can be cut up a number of ways, I tried to break it into pieces so it was all through the tart but I’ve seen it done as a long single piece so its really up to you! Toss a few of the mushrooms into each of the tarts. Dice the tomato and throw a few pieces in as well. Pre-heat the oven to 180 degrees. Bake the tarts at 180 degrees for about 15-20mins and take care not to overcook them as they’ll dry through the centre. The yolk should be just turning that lighter yellow when you take them out to rest for 5 minutes. Overturn the tins and gently remove the tarts. They may take some encouragement so I found it easier to run a knife around the edge first to make sure you get them out cleanly. 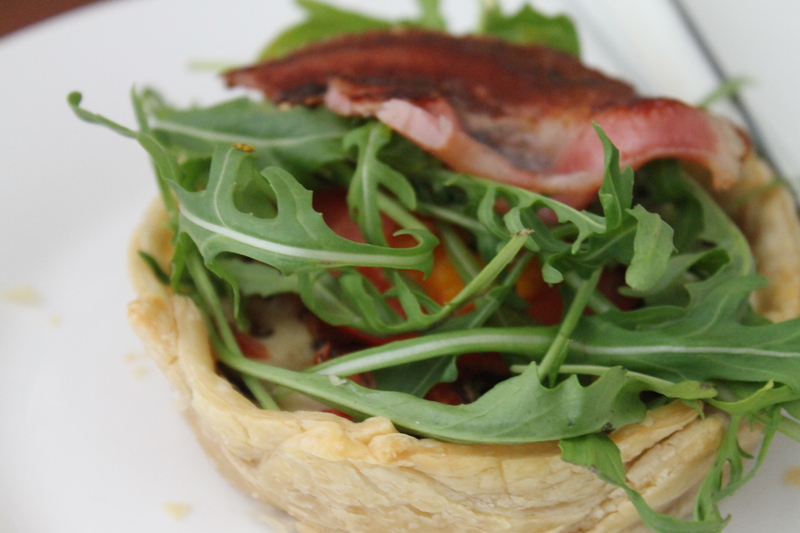 Serve each tart with a little Rocket on top to give them a little extra colour and flavour. Add salt, pepper and sauce to taste.